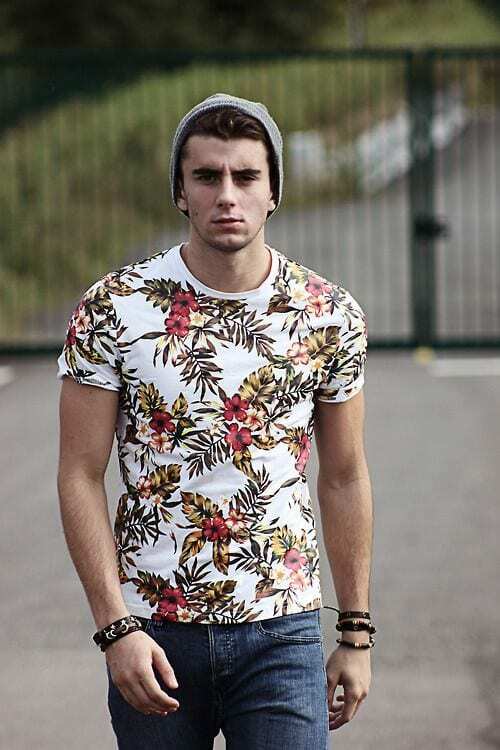 Best Floral Shirt Outfits for Men. Many people think of floral as a feminine print but that’s not how it is. The fresh print looks great on men as well. Like the color pink, floral prints are also a territory that can be tough to visit. But that by no means says that you should not try them. After all, it takes a gentleman to pose in a floral print. Just because many men have made fashion blunders when wearing floral shirts doesn’t mean that you shouldn’t try them. If you aren’t sure about whether or not it will suit you, don’t worry. We’re here to walk you through ways you can don a floral shirt in a classy manner. Firstly, don’t wear two different prints. Even if the contrast seems lovely, just don’t. You should wear lighter but brighter tones in summers and duller plus darker tones in winters. Floral prints don’t suit all occasions. Be mindful about where you intend to sport one. Heading to the beach or for a BBQ session with friends? Dare to be different. Don a floral print shirt that’s blue in color and combine the look with a pair of cropped white jeans or plain, light brown, loose Bermuda shorts. This type of outfit screams chill vibes and that’s why you should definitely try this look. Floral tees look perfect casually. They come in several materials, styles and designs. Choose one that suits you and breeze through the day. If you want you can go for collared tees. Those also look beautiful. The beanie hat is definitely the star of this outfit so do have a look at these 15 Ways to Wear Different Hats Fashionably, designed specifically for men. Fashion is all about self-expression. A floral button down when worn stylishly exhibits your confidence. When wearing a floral print keep the rest of the look toned down. Don’t opt for another striking print. That would be overdoing the look. Go for other plain clothing items. You can wear your button up floral shirt with jeans or shorts. You can also keep it unbuttoned with a plain round-neck shirt worn beneath it. Floral shirts come in short sleeves as well. These can be tees, polo shirts or dress shirts. Pair your half sleeves tee with plain shorts for the contemporary look. Though the snapback looks great with floral shirts, finding the right hairstyle can be tricky so do have a look at these Snapback Hairstyles for Guys. The long sleeves cuffed dress shirts of floral prints look classy with slim fit or straight leg jeans. Floral tees of full-length sleeves can be worn with a variety of trousers from jeans to khakis. Add a plain tie to your floral dress shirt for added drama! When you wear both the shirt and the shorts of a flowery print be sure to match both prints. You would have to be really dandy to be able to pull off that. A better choice would be to wear a plain item with a floral one. Double floral gives a Hawaiian look that one isn’t always aiming for. If you like wearing shorts then you will surely love these 20 Stylish Men’s Outfits Combinations with Shorts. Pockets make shirts better. Buy a floral shirt with pockets for a trendy look. Our eyes are really stuck on those red shoes! If yours are too then check out these 18 Ways to Wear Red Shoes for Guys. Floral printed shirts look best with dark jeans. It gives a stronger look; the look of a man who knows his fashion. The thing about leather is that it makes everything better. A leather jacket would enhance the overall look to reach the ideal balance. The fresh vibe of the flowery print with the powerful one of leather would make for an elegant yet fun look. Roll up the sleeves of your floral button down for versatility. If you’re heading out to the beach soon then here’s a great guide on What Men Should Wear at Beach? Don a plain pair of pants with a floral shirt. Keep the contrast classy and make a style statement. If you fear you can’t do justice to the floral shirt but you want to really try it then wear a denim jacket over the floral printed shirt to reduce the prominence of the summery print. Here are some more cool Denim Jackets Outfits For Men. Blazers and floral printed shirts outclass all other floral outfits. The look is both formal and informal. The best floral prints can be shopped online from original brands like ASOS or Forever 21. You can fetch one from other cheaper alternatives as well. These blooming prints are basically summertime staples. Bright prints and light prints should be chosen for the warmer weather. In the beginning, floral prints couldn’t be worn by men in winters. But now designers have started incorporating these cool prints in sweaters and other thick material shirts. Dark and dull colors like grays and blacks look best in the Winter season. Layering makes for great style. For instance, a floral shirt can be worn with a plain sweater and long boots. You could also wear these shirts with trench coats in Winters, here are the top 19 Ways for Men to Wear Trench Coats this Winter. The green floral shirt would make for an ideal one for the warmer days. The white and black floral shirt is for men who don’t like sporting multiple colors and are a class apart. Alternatively, you could also wear a shirt like this with white shoes so here are 16 Trendy Ways to Wear White Shoes. Red makes for the traditional and classy look. Try a blue floral shirt in either of the seasons! The only way to wear the floral shirt with swag is by carrying the apparel with confidence. Experiment but don’t copy styles. Be yourself and keep rocking fashion!